← Delicious Spam Musubi from Mister Musubi! Max’s Chicken Take-out Treat for Only Php299.00! Good news to all Max’s fried chicken lovers! Starting today, you can bring home your favorite “sarap-to-the-bones” Regular Fried Chicken for only Php299.00. That’s Php76.00 off the original price! 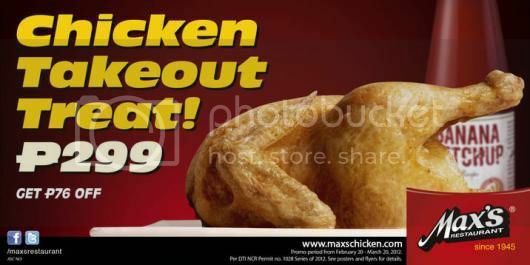 Max’s Chicken Take-out Treat will be available nationwide from February 20 to March 31, 2012. Log on to www.maxschicken.com to know more about the most mouth-watering offerings from Max’s or visit www.facebook.com/maxsrestaurant to be a Max’s Restaurant Facebook fan. This entry was posted in Max's Chicken Take-out Treat, Max's Restaurant. Bookmark the permalink. 3 Responses to Max’s Chicken Take-out Treat for Only Php299.00! yeeeey!! i love their chicken!! really? ooohhh, will definitely avail of this deal!!!! Hmmm not bad. But honestly, I am not very fond of Max. I dunno why but if given the chance, I would eat at another place.